My “Aha!” moment happened back in April 2012 after my routine annual doctor’s visit. I was having horrible digestive issues and was on prescription antacids for more than 2 years. I was also suffering from aches, pains, and fatigue. I always just closed my eyes when it came to the “weigh in” part of the physical exam. I told my doc to not tell me my weight, but she did mention that I had gained 10 lbs since the last visit! I was floored, because I didn’t really change anything about my eating habits in the past year. After my blood work came back, my doctor gave me a phone call to deliver bad news about my health. I was told that I needed to 20 pounds or go on meds for your cholesterol! And I was also given high dose antibiotics for 15 days since H. Pylori bacteria was detected in my stomach. H. Pylori, if untreated, leads to stomach ulcers and cancer. Yikes! I realized then and there that I needed to take control. Both of my parents lived unhealthy lifestyles. They both smoked and drank. 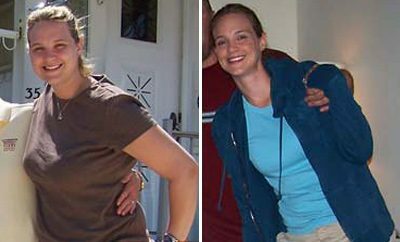 They never watched what they ate or exercised, so both were at least 100 pounds overweight. I was becoming them! My dad died of a heart attack when I was just 10 yrs old…he was only 52. My mom died of a stroke when I was just 27 yrs old…she was only 61. I have two young children: an eight year old son with autism and a six year old daughter. I NEVER wanted them to know the pain of losing a parent as a child like I did. That became my huge motivation … staying around for them. The day after I got that phone call from my doctor: April 25, 2012. I have gained and lost the same 78 lbs six different times in my life, starting at the age of 21. I was most successful with Nutri-System back when they had the physical centers. But, the problem was I never ate anything that wasn’t Nutri-food. I never learned how to eat! 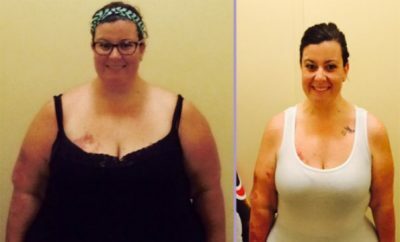 Once off their program, I found myself binging on all the foods I avoided for nine months. I did Weight Watchers twice…only losing about 20 pounds each time. I got tired of tracking points and writing down every spoonful of food that entered my mouth. Plus, they promote a lot of their pre-packaged sodium-laden frozen meals, etc. I’ve also tried “going it alone” and had some success, but got quickly bored, as my focus was always on what I “couldn’t” have and restriction instead of moderation. This time, I simply went online to find a BMR calculator and did some math. I learned that on average, I needed to cut 1,000 calories per day to lose two pounds a week. I researched the caloric content of my 25 favorite foods and learned about nutrition. I made some healthy swaps, such as having oatmeal every morning instead of a bagel. I kept a Post-It note on my desk to jot down calories. As I progressed, I had memorized the caloric content of my routine go-to foods and their correct portion sizes. I would weigh my meats on a food scale until I could cut a three or four ounce piece of chicken without weighing it — accurately — every time. I also avoided fast food, pre-packaged, frozen, or “boxed” meals, and instead ate whole grains, lean proteins, good fats, non-fat dairy, fruits, and veggies. I had to do a lot of introspection early on in my weight-loss journey. I kept trying to figure out exactly why once I lost the weight in years past, that I would FAIL TO KEEP IT OFF. I did not want to “diet” again, only to re-gain it. I wanted to make this a lifestyle change — a permanent one — but I didn’t know how to make it stick! The biggest challenge I had was mental. I had to completely fix my relationship with food. Marianne Williamson co-wrote a book with Oprah Winfrey called A Course in Weight Loss. It really peeled me like an onion! Ninety-five percent of weight-loss is mental. The other five percent is about the foods you eat. Unless and until you figure out why you are overweight to begin with, no amount of “dieting” will fix your problem. I realized that I was utterly depressed for the past seven years. Every time in my life when I was faced with hugely stressful circumstances, I would eat to comfort myself. My son was diagnosed with autism when he was two years old. I had no family who supported me. I had no mom. I had no dad. I had a husband who meant well, but was working 14-16 hour days. Even three different churches turned their backs on me and my son because they couldn’t handle his autism. When your child has cancer, people line the block with casseroles. When your child has autism, they see you in the grocery store and run the other way. Autism rips apart marriages when a child is diagnosed. No one wanted to be around my son (or me with him) because he was “weird.” Among other things, his behaviors consisted of vomiting when anxious, smearing feces on the wall, head-banging, spinning, rocking, spitting on objects then playing with it, peeing on himself, screaming, crying, and massive meltdowns. Let’s face it, when you’re scrubbing down your bathroom wall with Clorox for the fifth time that week because your son just “painted” it with his poop, you really stop caring if you eat chocolate. Sometimes eating a one pound chocolate bar for lunch was the only thing I had to look forward to that day. Food became my friend. My only source of companionship. My only source of pleasure and distraction from the hell of caregiving for autism. I had to completely give up my career as an attorney licensed to practice in two different states to care for my son and get him to the therapies he needed. “Comfort foods” really DO comfort you, you know! They raise the serotonin levels in your blood the same way drugs or alcohol would. Anti-depressants made me sick, but junk food did the trick! But once I realized that I was abusing food the same way a “junkie” abuses drugs, a light-bulb went on! What I was really searching for was fun, pleasure, beauty, connection, and joy in a situation that was completely devoid of it. I then realized that food was fuel only and those other things were found elsewhere. I can honestly say that I have always been a striver. I sincerely enjoy tough challenges, setting goals, and the feeling of pride I got in jobs well done. After doing a lot of soul searching, I realized I was happiest when leading others, or being put in a position of responsibility. I have this absolute need to “sit in the captain’s chair.” I love people and am very very social. I love connecting! Once I realized what made me truly happy, I used it to my advantage. As a busy mom, social media is often the only outlet I get to stay in touch and feel connected with friends. I used Facebook as an accountability tool. I would post my weight every other week — the good, the bad, and the ugly. It became my accountability. 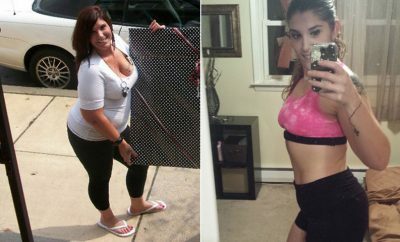 Once I lost about 40 pounds, people kept asking me about what I did. I started a public Facebook page called Weigh Smart Diet Divas as a resource to help other people. I posted my food lists and entire story there. My friends also asked if they could join me. So, I also created two private groups. Being a leader and realizing I now had people who were looking to me for guidance and motivation in their own weight loss journeys helped me stay on track and stay motivated. It still does! But most of all, I had to get rid of the dieting and all or nothing/ perfectionist mindset. If I had a day when I made unhealthy food choices, I simply got back on track the next day and never looked back. For me, it was all about creating new habits that became automatic. I did hit a “slow down” period about 45 pounds down, but never actually plateaued. I simply would cut back 50-100 calories more out of each day until I started losing again. As your body gets smaller, it just doesn’t need that much to sustain itself as it once did. 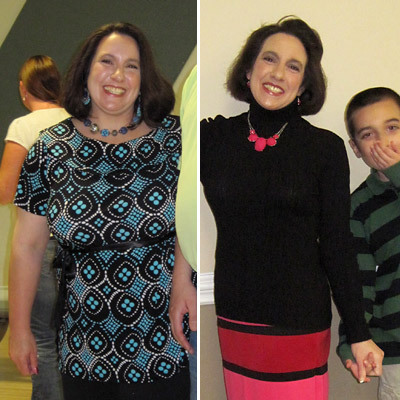 About halfway to goal (after 45 pounds gone) I became 100 percent holistic in my food choices. I completely stopped eating white flour, white sugar, refined carbs, anything processed, candy, sweets, and fast food of any kind. I would still eat pizza and chocolate, but I would always count those calories. As I got closer and closer to goal, I had a lot less wiggle room with the types of foods I treated myself with. The last 10 pounds were the hardest. Very early, I decided not to exercise one bit — something that was different from all my other attempts at weight loss. What I mean by that is that I never went to a gym. In the past, I tried to change too much too soon — changed my diet, vowed to exercise. It was just too much! I only have a precious five hours per day to myself when my kids are at school, so I realized that exercise needed to fit into my life seamlessly for me to do it! As a stay-at-home mom of two school-aged children, (one with autism), no family to help out, and a husband who works 16 hour days, my life is crazy busy. Most days, I am up by 3 am and collapse into bed sometime around 7pm. So when I say that I am too busy to exercise, I am not making an excuse. My whole life is exercise! I realized this and just decided to focus on the things I could change — which was the food I was eating. My exercise now is 20 minutes of playing frisbee with my three dogs, speed-walking through Walmart and Kroger, constantly cleaning my house, and literally running around. I’ll park in the farthest parking spot from a store and run/walk to the entrance. 4am breakfast: 1/2 cup of quick oats microwaved in 1 1/4 cup water. Six ounce fat-free yogurt. One banana. 8am mid-morning snack: 3-4 raw carrots, 3/4 cup of lentils, 2 1/2 cups freshly-brewed Lipton green tea with two packets of Splenda. 11am-1pm lunch: Six ounce broiled salmon or grilled chicken. Sometimes I’ll have it between two slices of toasted wheat bread and a slice of American cheese. An apple or another seasonal fruit. 3-4pm dinner: I usually don’t eat dinner at a traditional time because of my early bedtime and acid reflux issues. I’ll usually have another 6 oz of fat-free yogurt, another banana, and 3/4 cup of Kashi GoLean! Crisp Toasted Berry Crumble. It’s a light supper really. Once or twice per week, I’ll go out and eat lunch at a restaurant and just order whatever I want without counting calories. Or I’ll splurge on some food that I don’t normally eat, such as chocolate or dessert. Gotta go with 6 oz of fat-free yogurt, banana, and 3/4 cup of Kashi GoLean! Crisp Toasted Berry Crumble cereal. High in fiber and protein and oh so yummy! Makes a great dinner for me or a quick to-go meal. Also, lentils, lentils, lentils! Those things are magic beans I tell you. I have eaten them every single day during the past year. Not only does 3/4 cup of lentils have 20 grams of fiber and 22 grams of protein, but lentils might also help speed up the body’s metabolism. They keep you full for hours and control insulin levels, allowing your body to access fat cells for fuel rather than blood sugars. I don’t understand the word “temptation.” If by that you mean foods that are not-so-healthy for you vs. foods that are optimal, then I would say enjoy them in moderation. Just cut back on portion sizes and count those calories! Slow down when you eat! Savor every bite! Plan for them! Often times, craving a certain food is your body is telling you that it is deficient in some nutrient. Avoiding foods creates the “forbidden fruit” syndrome. Learn how to incorporate them in a healthy way! For example, when I really wanted a sweet, I told myself that I can only have it after I ate healthy from every food group. You know what? Once I got all of those healthy foods in, I had room for only two truffles. So my “big treat” only set me back 150 calories! Some foods are “trigger” foods for me. Pizza, for example, is something I never really learned how to incorporate. I would try to eat one or two slices, but end up eating six or seven slices! (I’m half Italian and my blood is marinara sauce!) For those kinds of foods, I just found complete avoidance to work best. Out of sight, out of mind. But when I really really wanted it, I’d completely indulge until I couldn’t stomach any more. That would get it out of my system and then I could once again avoid it for weeks. Usually though, temptation would hit when I was neglecting myself in some way. I was tired, stressed, or didn’t get enough sleep. Simply being able to identify what was REALLY going on mentally helped tremendously. It’s not that I wanted the CHOCOLATE…it’s that I wanted to REST and RELAX. Pretty much the same as it was before the weight loss, only now I have tons more energy! I don’t have the constant fatigue, aches, pains, or reflux. I’m able to do a whole lot more physically. For example, last spring break (when I weighed 218 lbs), I went to a bed and breakfast with horseback riding (my favorite hobby!) by myself. They offered a 2.5-hour long trail twice a day. I could only ride once per day because it just exhausted me. 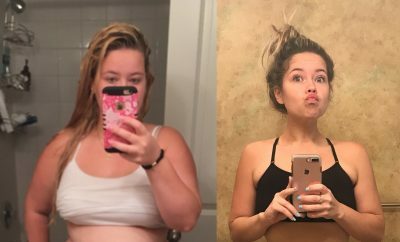 After losing 95 pounds, I went to the same bed and breakfast with my daughter. Not only could I ride the trails twice per day (5 hours in the saddle), I did so with her in front of me in the same saddle! Tandem riding is difficult! I’m better able to run after my kids and actually play with them, not just be in the same room! Become familiar with your favorite foods and their nutritional values. Know the caloric count of everything you eat, and rather than cut out certain foods, cut back to proper portion sizes.Write down your calories daily on a post-it note. When you hit your limit stop. Become mindful about everything you are eating. Fix your mindset. Ninety-five percent of weight loss occurs in your head, the other 5 percent is what goes in your mouth. It is all math, pure and simple. Get rid of the negative thoughts. Choose your words carefully. For example, I was never “on a diet”… I was engaging in a “healthy lifestyle re-vamp.” Be willing to do a lot of self-examination about why you became overweight to begin with. Become accountable to someone other than yourself and enlist their support! I used Facebook. Vow to weigh yourself no more than once per week at the same time of day under the same conditions. Jot it down on an index card along with notes. Have a dream. I realized that I lost myself in becoming a mother. The intensity of raising a child with autism forced me to take the focus off myself for a while. Today, I can proudly say that my son is pretty close to being “cured” (meaning all traces of autism spectrum disorder behaviors are gone). He is still delayed, but now that we’re through the worst of it, I can focus on my own goals and dreams more. My big dream now is to become a lifestyle coach and motivational speaker. To empower and help others! Make this a lifestyle not a diet. Identify your whys: Why am I overweight to begin with? and Why do I want to live a healthy lifestyle? My “big why” became being around for my kids and watching them grow up! I want to see them get married, go to college, drive a car, and maybe have families of their own someday. My parents never got to.